How could it be? How could the Pac-12 have three teams in the top six of the final regular season AP poll and still be underdogs in six of the seven upcoming bowl games? USC’s ban from postseason play, for one, which meant league also-rans got bumped up to better bowls. Match-up problems, for another. And lest we forget that lack of national respect that has dogged the Pac-12 for several years now. During the 2010-11 season, only four teams made the postseason and the record was a pedestrian 2-2. The season prior it was an ugly 2-5. 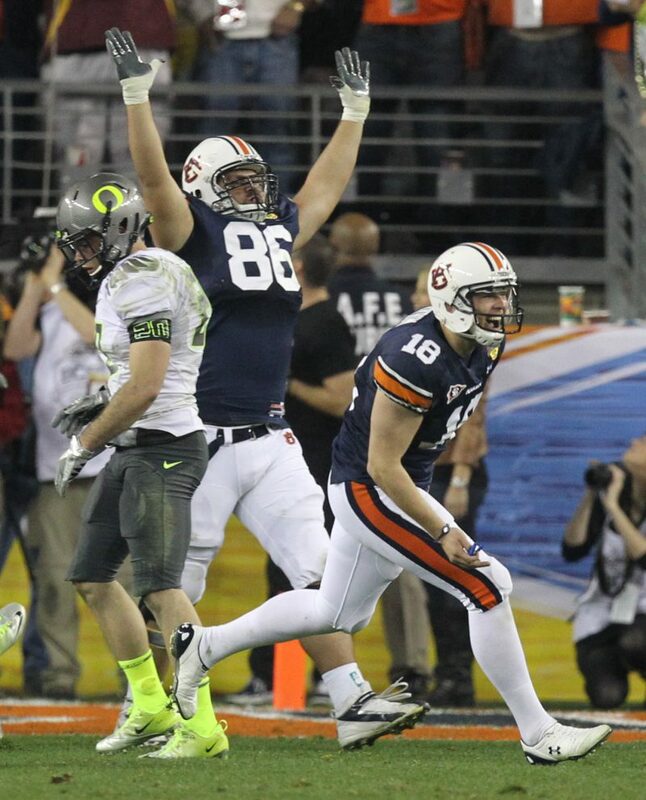 The Ducks have lost two straight BCS bowl games, including this 22-19 national championship defeat to Auburn last January. Will Wisconsin extend the streak to three? But I beg to differ this bowl season. Here’s to the notion that the league fares better than many anticipate. No way it takes all seven games or six of them. But the projected gloom on the horizon? Ain’t gonna happen. When: Dec. 22, 5 p.m.
Stat to remember while lounging on the couch: Boise State quarterback Kellen Moore is 49-3 as a starter. Skinny: Of the 35 bowl games on tap this month and next, this one may be the most likely to turn into a rout. Dennis Erickson is coaching his last game for the Sun Devils, a dysfunctional bunch, with new coach Todd Graham looking over his shoulder. On the other side of the field, quarterback Kellen Moore (74 percent completion rate, 41 TDs, 7 INTs) will be playing his final game in an historic Boise State career, and the Broncos are smarting after being overlooked again for a BCS bowl game. ASU’s Brock Osweiler (63 percent completion rate, 24 TDs, 12 INTs) has the ability to keep his team in the game for a spell. But by the middle of the third quarter, this one should be all blue and orange. When: Dec. 28, 5 p.m. Skinny: Both of these programs have failed to match expectations brought about by good recruiting classes over the past few years — although doesn’t Texas always do that? Both are eager for a springboard into next year. Much is being made about the Longhorns’ defense and the belief by many that it will shut down Cal running back Isi Sofele (1,266 rushing yards, 5.5 ypc). But down the stretch, California played its best ball of the season, winning four of its final six, including coming up just three points shy against No. 4-ranked Stanford. The Longhorns, meanwhile, lost three of their final four and possess neither a strong running nor a strong passing game. There are rumblings in Texas over coach Mack Brown’s record the past two seasons (12-12). Expect that to only grow louder and for the Bears to give the Pac-12 a boost of respect. When: Dec. 29, 6 p.m.
Stat to remember while lounging on the couch: Washington has given up at least 31 points a game seven times this season. When: Dec. 31, 12:30 p.m.
Stat to remember while lounging on the couch: The Illini went 0-6 after starting the season 6-0. Skinny: What a limp story line — two teams without their head coaches, who were both mercifully shown the door at the end of the regular season, and one team with a losing record. What’s to play for? Not much, unless you are an underclassmen who wants to show the new coach a thing or two. In that case, the Bruins, who have recruited extremely well of late, should have an edge. Statistically, the two QBs (UCLA’s Kevin Prince and Illinois’ Nathan Scheelhaase) are a wash through the air. Which brings us to the running game. Yes, the Illini have a stout ‘D.’ But the Bruins’ big offensive line should open enough room for Johnathan Franklin (947 rushing yards), Derrick Coleman (726 rushing yards) and Prince (455 rushing yards) to move the chains. In comparison, Illinois’ top ground-gainer, Jason Ford, has just 600 yards on the season. When: Dec. 31, 11 a.m.
Stat to remember while lounging on the couch: The Yellow Jackets have lost their last six bowl games. Skinny: The point spread doesn’t say so, but this one has a pick-’em flavor to it. Georgia Tech probably has the better athletes. But Utah is a well-coached, team-first squad. The Yellow Jackets’ option offense is led by the versatile QB Tevin Washington (1,515 passing yards, 10 TDs, 8 INTs, 890 rushing yards) and is third in the nation in rushing yards per game. The Utes have a tough stingy defense to counter. To complicate matters further, Utah has John White (1,404 rushing yards) to go up against a poor Georgia Tech rush defense. Like I say, pick ’em. When: Jan. 2, 5:30 p.m. Skinny: The media take so far is that the Cowboys have too many match-up advantages for the Cardinal to overcome. Funny, that was pretty much the same line of thinking a year ago before Stanford wiped out Virginia Tech. Other than its loss to Oregon, Stanford met all challenges this season, including beating a really good USC team in Los Angeles in overtime and soundly thumping Notre Dame in the regular season finale. But Oklahoma State, just barely nosed out of the BCS title game in favor of Alabama, is a well-oiled machine and eager to take the title-game slight out on a foe. The Cowboys should keep the Stanford defense running in circles, much as the Ducks did, behind QB Brandon Weeden (72 percent completion rate, 34 TDs, 12 INTs), running back Joseph Randle (1,193 rushing yards, 6.0 ypc) and wide receiver Justin Blackmon. In the end, though, the best player on the field, Heisman runner-up and projected No. 1 NFL Draft pick Andrew Luck (70 percent completion rate, 35 TDs, 9 INTs), is likely to enjoy the last laugh. And don’t be surprised if it unfolds as a dramatic game-ending drive. When: Jan. 2, 2 p.m.
Stat to remember while lounging on the couch: Badger running back Montee Ball has 38 TDs on the year. Skinny: It’s an odd way of looking at things, but if Wisconsin had defeated TCU in last season’s Rose Bowl, would Oregon be even more of a favorite in the upcoming Granddaddy of Them All? Perhaps. What we have now are two teams extremely motivated to put an end to recent BCS bowl losses. And that should keep this one close for most if not the entire contest. In some ways, this game is the classic power vs. speed match-up (although the Ducks and the Badgers certainly have elements of both). Like past Big 10 champs, the Badgers are strong defensively and big up front offensively. But they don’t have the overall team speed that Auburn (last season) and Ohio State (the previous season) did in BCS bowl games against Oregon. If turnovers remain relatively even and star running backs LaMichael James and Montee Ball cancel each other out — they have rushed for a combined 3,405 yards this season — the Rose Bowl may come down to which QB can get his teammates playing at their desired pace the longest. Here’s thinking hyper-fast Darron Thomas, who usually shines when the Duck running game is flourishing, outperforms the Badgers’ smooth Russell Wilson in that regard.